I need mixed page sizes in a word 2007 document. Some have to be letter size and some have to be legal size. How do I do this? You can have pages of all different sizes and orientation in the same Microsoft Word document. This is accomplished by creating sections and changing the paper sizes for each section. In this example, I will pretend that I am working on a 5-page letter size (8.5″x11′) document, but the third page needs to be tabloid size with landscape orientation. By the way, this is how you create a fold-out page, which is a very common task when creating workbooks and manuals. First, to follow along with this tutorial, you need a 5-page Word 2007 document. To quickly create one, press Ctrl+N to open a new file. On the first line, type the code =lorem(60,5) then press Enter. When working with a Microsoft Word document that contains sections, show all formatting characters by pressing Ctrl+*. This prevents you from accidentally deleting section breaks while editing the document. Place the cursor at the beginning of the first sentence on page 3. On the Page Layout tab, click Breaks > Next Page. Place the cursor at the beginning of the first sentence on page 4 and repeat step 2. To see your newly created sections, double-click in the footer area to open the footer. You can now see that pages 1-2 are in Section 1, page 3 is in Section 2, and pages 4-5 are in Section 3. Double-click in the body of the page to close the footer. Follow these steps to change the paper size of page 3 (and the orientation, if needed). Place your cursor anywhere in page 3. On the Page Layout tab, click Size. 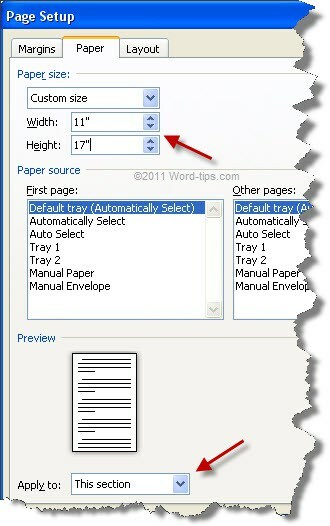 Select More Paper Sizes > Custom. Under Apply To, select This section. Change the printer paper source settings, if needed. If you want to change the orientation of the page, on the Page Layout tab, click Orientation > Landscape. Make as many sections as needed to accommodate the mixed page sizes. Keep in mind you may need to print the large pages separately if your printer cannot automatically select the paper source according to page size.